In conjunction with the release of our new and updated E14 spotlights we also released our new GU10 model. We use the same 5 Watt full spectrum COB (chip on board) and both lamps have been fitted with the same metal housing with the main difference being the socket. 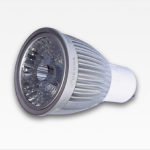 By switching from single LED chips to COB, we have successfully improved two things with this new product. Our new COB have twice as many chips on the board compared to previous model, giving us better control over the ratio and spectrum. This allows us to better customize the spectrum for different plant pigments but it also allows us to get an even better CRI value than before which means the new model both works better for plants and is more suitable for use indoor use. Anyone that has previously used regular LED plant lights with a high amount of red light know how inappropriate they are to be used indoor, not to mention how hard they can be on the eyes. This is a non-issues with our plant spotlights as they contain and reflect all colors of the spectrum making them suitable for regular indoor usage.